Of course, June is, as most of you probably know from the headline, the month of Glastonbury Festival. The Worthy Farm bash always brings in the big name acts, with an AC/DC appearance being thrown around a lot over the last two years, particularly since Metallica’s headline slot. Not only will the band be playing a show in London and one in Manchester, they’ll also be touring the rest of Europe, including dates in Portugal, Germany and Czech Republic. Their last show, on the 12 June in Denmark, leaves the rest of the month free, with Glastonbury starting on the 26th. Last year saw headline sets came from Kanye West, Florence and the Machine and The Who, with the Foo Fighter’s having pulled out of their set due to Dave Grohl’s broken leg. Bookies favourites to headline the festival include Adele, closely followed by Coldplay, as well as the Foo’s who are expected to come back and play their cancelled show. 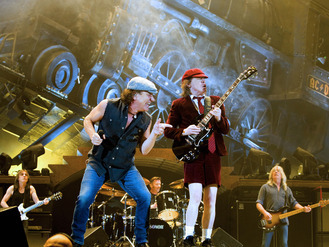 Tickets for ACDC’s two UK dates on 4 June and 9 June 2016 are available through the links below on the 18 December, just in time for Christmas.